ChronoSync is designed to be flexible. It can meet the needs of any synchronization or backup strategy, no matter how simple or complex. In some instances your needs may NOT be as simple as backing up one folder to another folder. You may, for example, want to backup many different folders throughout your hard drive or perhaps backup one folder but not backup some of the folders contained within it. ChronoSync can handle any scenario you have and there are various methods that allow you to exclude or include folders. ChronoSync is a document-based application. This means that to create a backup or synchronization task, you create a synchronizer task document to define that task. All of the settings — targets, options, rules, etc. — are saved within each defined task document. This document-based approach offers fine-grain control over your synchronization and backups. You can create as many or as few synchronizer task documents as desired. The scope of a synchronizer task can be a single folder with just a few files or an entire hard drive with millions of files. Multiple tasks can specify the same source for a backup operation but different destinations. Tasks can be chained so that the output of one is the input for another. Multiple tasks can also be combined in a single task container and behave like a single task — the possibilities are truly limitless. This guide will present a variety of techniques that build upon the document-based concept. You can use one or a combination of the methods listed below to narrow down your backup scope using ChronoSync. Using a creation assistant will help you get your backups configured and running quickly and easily. Assistants guide you through the process of configuring a synchronizer task to achieve a specific goal. This helps to quickly get your task configured with the required settings without being exposed to the optional settings that could be overwhelming. You can view the creation assistants by choosing 'Use a setup assistant' on the ChronoSync Organizer window. ChronoSync provides a handful of creation assistants. The one best suited for backing up specific files and folders is the 'Multiple Folder Backup' assistant. This assistant will create a synchronizer task that will backup multiple folders that you choose and copy them and their contents to a single destination. The Narrow Scope Approach focuses on configuring synchronization and backups to scan a very specific set of files and folders. You typically will setup multiple synchronizer tasks and combine them or run them individually. If you want to synchronize or backup all your personal documents or files you would simply select the folder they are contained in as the target. This is the method you should use for synchronizing a single folder. 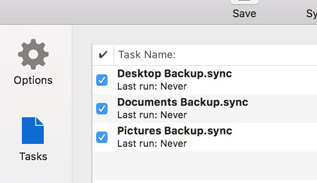 If you wish to synchronize multiple folders, use separate tasks for each folder you wish to backup. For example, instead of creating one task for your Home folder, perhaps you want to create three: one for "Documents," another for "Pictures" and a third for "Desktop." Each task can be run separately. If you created three tasks for your "Documents," "Pictures" and "Desktop" folders (as mentioned above), you could add them to a single task container so all three behave as one. A task container will run multiple tasks as one. This is a really convenient and clean way to keep track of multiple tasks. The broad scope approach targets a a very large set of files and folders to synchronize or backup. It typically includes many more folders than you actually want to scan, so you will add conditionals such as rules and/or exclusions to narrow down the set of files that actually get processed. You can permanently exclude any file or folder pair by selecting it in the Analyze panel and choosing the "Exclude" command from the "Actions" menu. The exclusion will be saved with the ChronoSync task document and the excluded file/folder will be skipped every time a backup is performed. When a folder is excluded, all the files and folders contained within it are likewise excluded. For example, if you wanted to backup your entire Home folder but did not want to include your “Music” folder, you could select your home folder as one of the targets and then exclude your “Music” folder from the Analyze panel. Read the tip Excluding A File Or Folder for all the details. When using the "Exclude" command to restrict items from your backup/sync, you may want to think about how new items added to the target folder will be handled. Do you want any new items saved in the target folder or any subfolders automatically backed up/synced? Most times, this is the desired behavior but you may have instances where you know new files or folders will be added but you don’t want to include them in this sync. You can use the 'Auto-exclude new items' option. Consider your Desktop. Maybe you keep a few folders on the Desktop that you use regularly and sync these folders regularly with your laptop. However, you also use the Desktop for temporary items, and have other files and folders that you don't want to sync to your laptop. In this case, you can create a task that targets the two Desktop folders and use the "Exclude" command to limit the sync to only the important few folders. Next, on the "Options Panel" in the 'Special File/Folder Handling' section enable "Auto-exclude new items." In this case, you also enable "Only at root level." With these options set, no matter how many new files or folders you add to your Desktop, only the important folders will be synced. Also, with "Only at root level" enabled, any new files or folders you add to your targeted important folders will also be synced. Without the "Only at root Level" option, any new file or folder in the entire Desktop tree will be automatically excluded. You can create an Alias and have ChronoSync lookup the original item to backup/sync instead of locating and targeting the original item on the Setup Panel. This comes in handy when you have several items such as files or folders you want to backup in a single task, but they are located in different places, or you want to group items for backup. Maybe you have a "Projects" folder where you keep your work files organized. Some projects are active and some are inactive or historical. It would be good practice to backup your active projects frequently. Maybe every day or even more often. The inactive or historical projects are backed up less frequently since they don't change much. Over time, active projects become inactive. To handle this situation you could create two Project backup folders. One for "Active Projects" and one for "Inactive Projects." Next, create an alias for each project folder and move the alias to the appropriate backup folder, either Active or Inactive. Now you can create tasks to backup your projects. The first task would target "Active Projects" as the source and the backup location for your Active Projects as the destination. Since your source target is a folder that contains a list of aliases you will want to enable "Resolve Aliases" on the 'Options Panel' in the 'Special File/Folder Handling' section. 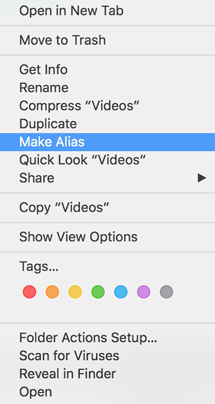 Now since we are backing up a folder of aliases, we only want to resolve that list of aliases and not resolve aliases that might exist in our projects, so enable the "Only at root level" option. Now, this task will backup your Active Projects by looking at the list of aliases, finding the original project folder and backing that up to your backup destination. You can do the same for your "Inactive Projects." Schedule your Active Projects Backup to run frequently, and have your Inactive Projects backup run once a week or as needed. Now, when you finish a project, you can drag the project folder alias from "Active Projects" to "Inactive Projects" to modify your backups without having to modify your tasks. This same technique of building a list of aliases in a source target folder can be performed for any file or folder located on your system. As long as you enable 'Resolve Aliases' and 'Only at root level' your task will backup or sync the original items to your desired destination. You can create rules which allow you to include or exclude specific files and folders from a backup. If you just want to backup all your Photoshop (.psd) files to an external hard drive no matter where they are located on your Mac, you could select your entire Mac’s hard drive as one target and a folder on the external hard drive as the other target. You could then create a rule to only backup Photoshop files — all other types of files will be skipped. Note that rules can slow down a task noticeably because each rule must be evaluated for every file and folder encountered in the sync tree. One important rule type to become familiar with when trying to narrow down your scope is the 'Parent Pathname' rule. Using it will allow you to copy specific folders that are located inside your target root. Suppose you wish to copy a folder called "Family" located directly inside the root of the Pictures folder and all its contents, both files and folders. Select the Pictures folder as your source target and create the following two "Intermediate" rules below and connect them with "Or". The "Name" rule will include the actual folder in the target. Use the "Parent Pathname" rule, using "File and Folder contains", for the folder you want to synchronize — this will include all files and folders within the folder you want to synchronize. Say you want to backup your entire Home folder but do not wish to backup your entire "Library" folder, just the "Mail" folder inside of it. This can be accomplished by creating two tasks and then adding them to a task container. First, you would create a task to backup your entire Home folder, excluding the "Library" folder via the "Exclude" action. Second, you would create another task to backup just your "Mail" folder. Finally, you could combine both tasks in a single task container. This way your "Library" folder gets completely excluded but the "Mail" folder still gets backed up. Furthermore, any new folders added to your "Library" folder would not get backed up so you would not have to modify your exclusions in the future.